She’s having great fun practicing and playing at Amarilla Golf Course in shorts and polo shirt and says it a wonderful place to be in October as the sun shines every day. Anna says “ All the courses I have played here in Tenerife have been fantastic, its so nice to escape from the cold and rain and come to Tenerife and enjoy my sport in such wonderful conditions… I will defiantly be back and recommend Tenerife to anyone who wants to enjoy golf in the sun”. We here at Golfing Tenerife wish this talented young golfer good luck at Q school and she promises to keep us all updated as her career evolves . An incredible achievement by the Smith family , Bill , Muriel and Paul. who are the owners of the very successful Golf Shop you see from the TF1 motorway. 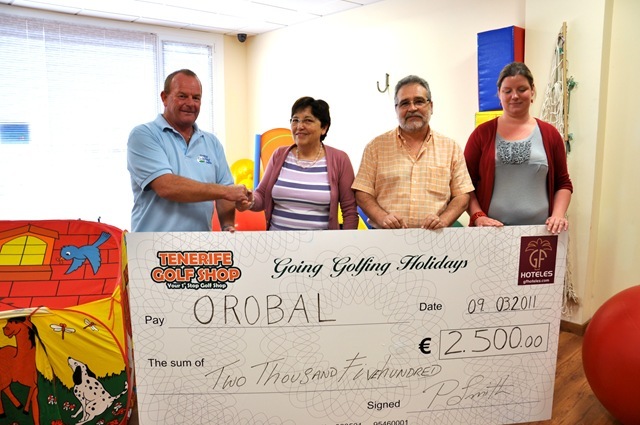 They have been running their “Hole in One for a holiday competition “ at Amarilla Golf Course and Adeje Golf Courses for the the last nine months and in that time have given an amazing 4000 Euros to the charity group Orobal and its an ongoing commitment. So if your coming on a Golfing holiday to Tenerife this year ? 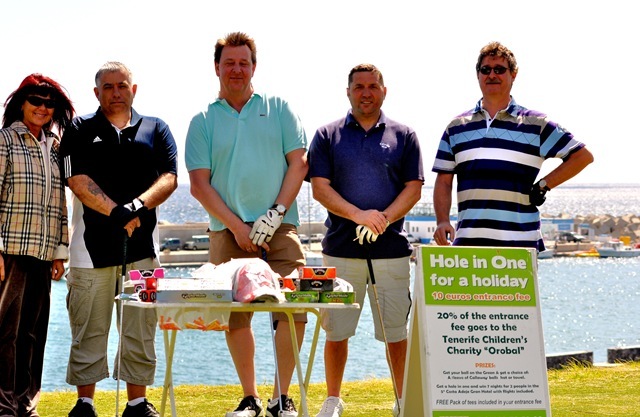 If you see the “Win a holiday for a hole in One” girl at the major courses here in Tenerife please give it a go as you are safe in the knowledge 20% off your money goes to Orobal and helps kids get those special wee things that makes their life’s that little bit better. Tenerife – a different golf option. The Mar-Y-Sol Tournament For all. 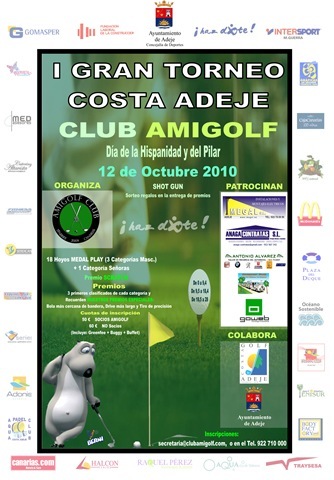 On November 30th 2010 we celebrated the 2nd International Mar y Sol Open 2010 at Amarilla Golf & Country Club (Tenerife). This very special event, organized by the Mar y Sol Hotel was hailed once again as a massive success. 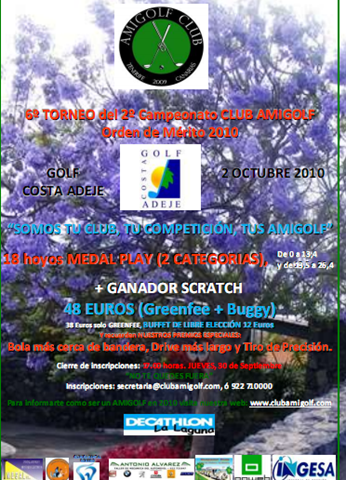 50 competitors from across the globe fought to win the 2nd International Mar y Sol Open 2010. Initially the tournament was to be played two days, but the torrential rain on Monday, 29th forced the competition to be suspended. On Tuesday with the sun finally shining this integration tournament was played in superb conditions. Each of the players has an official HDC, but many of the participants cope with an additional type of handicap. Some players are visually impaired; others may be single or even double amputees, paraplegic or hemiplegic. 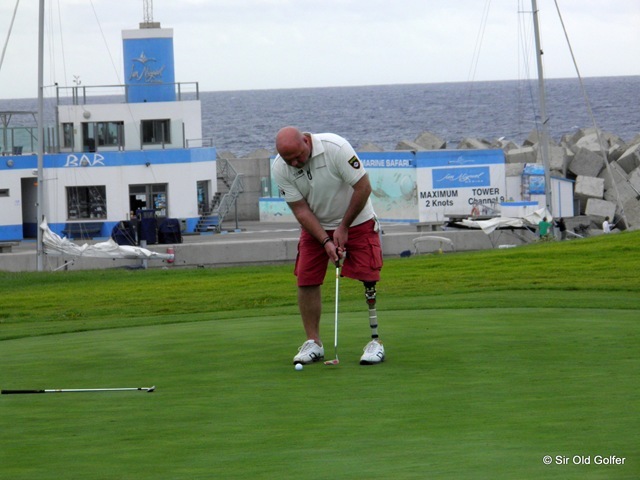 All over the world there have been separate tournaments for golfers with different abilities. So, able-bodied golfers would play in their own competitions, golfers with impaired sight would play in a tournament together or those with missing limbs would play in another one. This tournament brings all of the golfers together and the vagaries of the golf handicap system allow them all to compete equally in a competitive integration tournament. I spoke with Renate Kraus, manageress of Mar y Sol Hotel and organizer of the tournament. The inventor of the “powergolfer” sports wheelchair, Christian Nachtwey, explained that each golfer has to individually adapt either through special equipment or by developing their own golf swing to find a way to get the ball around the course. 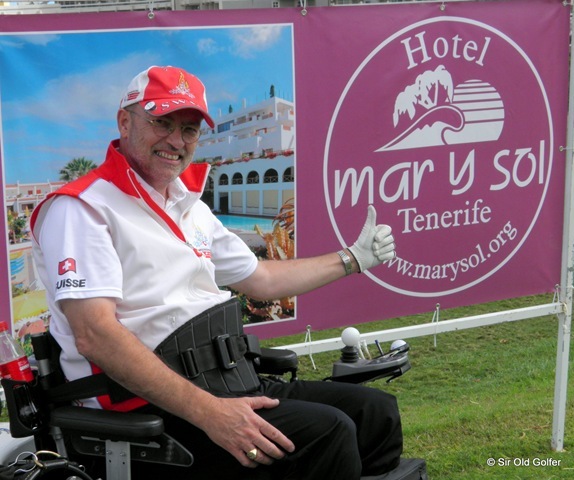 Golf is a unique sports option and Mar y Sol Hotel offers in Tenerife “get into golf” courses for the disabled from January to March 2011. An experienced coach will show the wonderful world of pitching and putting to all newcomers. 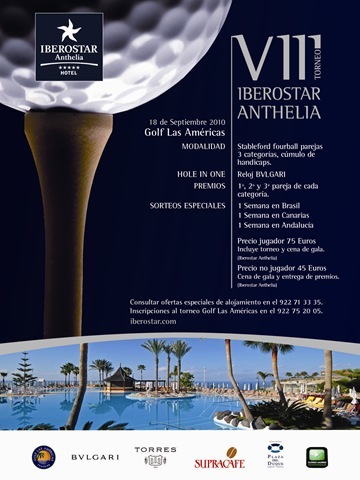 The Award Ceremony took place in the afternoon at Amarilla Golf & Country Club. The winners were awarded their prizes by Renate Kraus (Manager of Mar y Sol Hotel), Michael Baker (Captain of Amarilla Golf Club) and Mª Luisa Forniés Fdez. del Castillo (President of the Canary Golf Union). The gross winner of 2010 International Mar y Sol Open was Luis Vicente Mateu Sisternas from Spain, with a score of 22 points. The net winner was David Hill from Great Britain, with a 37-point score. The category one winner with a 25-point score was Joan Pere Morera Castell from Spain. The category two winner with a 32-point score was Michael Baker from Great Britain. The category three winner with a 34-point score was Miroslav Lidinsky from the Czech Republic. The “nearest to the pin” prize was won by Linda Williams from Great Britain. The “longest drive – ladies” prize was won by Marjo Boissovain from Switzerland. The “longest drive – gentlemen” prize was won by Gerhard Fuchs from Germany. You don’t want to miss this one Tenerife Golfers.. The raffle prizes include a weeks holiday in Brazil, Andalusia and the Canaries at one of the Iberostars great 5 * Hotels plus many more I would like to win prizes. Here is the video of what we got up too …The Portuguese won this time but we plan to make this an annual event..Great fun was had by all.